With everyone in such a rush to get the hell off this planet, we’re gonna need some pretty sophisticated digs to ferry us to the Moon, Mars, and beyond. 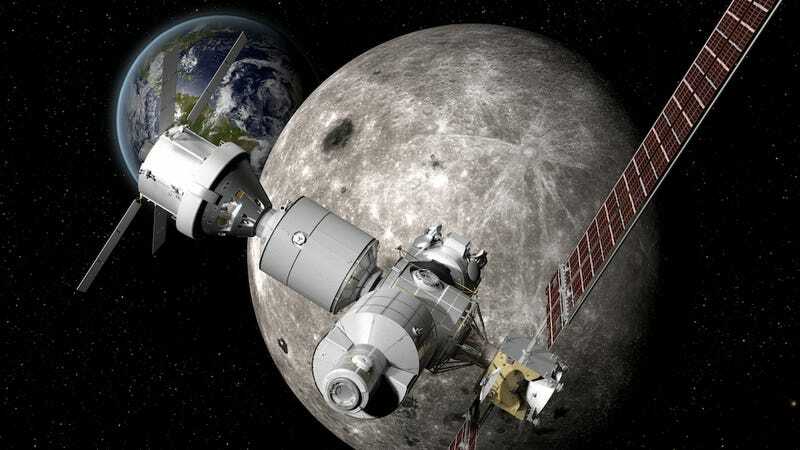 Thankfully, Boeing’s all over it: On April 3rd, the company revealed its concepts for a lunar outpost and a deep space explorer. I’m not one to dole out compliments but damn do they look good. While details are still pretty thin on the timeline for these bad boys, there are a few things we know for sure: Boeing plans to use NASA’s Space Launch System (SLS)—which, upon completion, will be the most powerful rocket the agency has ever built—in order to send a habitat into the Moon’s orbit. This outpost, dubbed the Deep Space Gateway, will be similar to the International Space Station (ISS) in that it will create a space to do scientific research while providing a destination for transportation vehicles to dock. In theory, Boeing’s Deep Space Transport vehicle could stop there on its way to the Red Planet, likely carrying humans. “The ability to simultaneously launch humans and cargo on SLS would allow us to assemble the gateway in four launches in the early 2020s,” Pete McGrath, director of global sales and marketing for Boeing’s space exploration division, said in a statement. According to Boeing, both the Deep Space Gateway and the Deep Space Transport vehicle will utilize solar electric propulsion technology. The Deep Space Transport vehicle will have some sort of unspecified system to protect passengers from the harsh radiation from deep space, as it could pose a significant risk to their health. Then again, anything that has to do with the cold, unfeeling vacuum of the final frontier is going to come with some sort of risk. Though it’ll definitely take a while to get this space station and its intrepid explorer into space, I’m sure it’ll be worth the wait.